Who’s the Best Pound-for-Pound Fighter in the World? Now that the former pound-for-pound undisputed best pugilist in the world, Floyd Mayweather has retired following his victory over Andre Berto last September, the search begins for who’ll replace him as the best fighter in boxing. There are many deserving boxers such as Roman Gonzalez, Sergey Kovalev, Andre Ward, among others, that have exceptional credentials and significant victories that make them worthy to be considered the best fighter in the world. 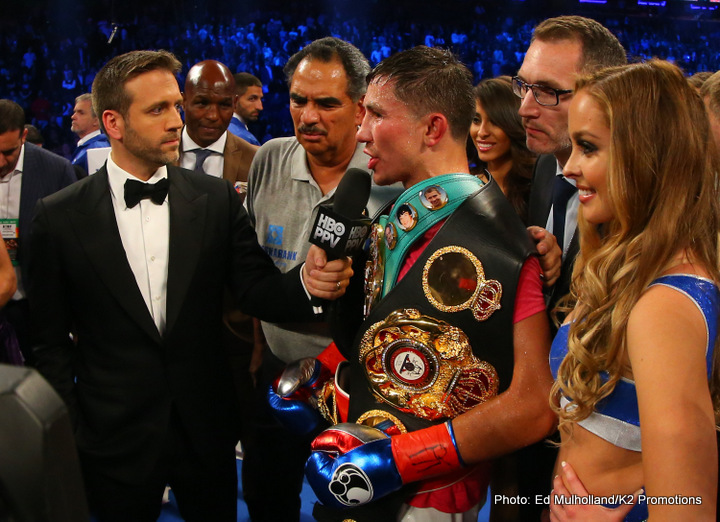 The boxer; however, that stands out above everyone else as the best pound-for-pound pugilist in the world is Gennady “GGG” Golovkin. The undefeated 33-year-old middleweight knockout artist demonstrated to the boxing world that he’s the best fighter in the world after his last outing. He completely dominated former world champion David Lemieux in what was supposed to be his most difficult professional fight to date. Instead, GGG cruised his way to a one-sided eighth round technical knockout for his 21st consecutive knockout victory and improved his record to 34-0, 31 KOs. He increased his knockout win ratio to 90 percent, the second highest for a world champion behind WBC heavyweight title holder Deontay Wilder. Golovkin holds the IBO, WBA, and interim WBC belt and with the victory, he added the IBF strap to his extensive collection. He has successfully defended the middleweight title 15 times which moved him past Hall of Famer Carlos Monzon’s record of 14 and put him into second place behind future Hall of Famer Bernard Hopkins who made 20. GGG will look to continue his dominant run in boxing when he takes on undefeated Dominic Wade (18-0, 12 KOs) on April 23rd. Golovkin is so good that no one wants to fight him. He’s a purely dominant boxer who has destroyed one opponent after another with relative ease and he doesn’t really have any glaring weakness. GGG has tremendous power in both hands, is extremely technically sounded, has very underrated speed and defense, and a great chin that has prevented him from ever being knocked down as an amateur or as a professional. He’s also an extremely active world champion who likes to fight three to four times a year, when most titleholders box once, maybe twice a year. Some critics might argue that he hasn’t faced the best competition and while that is true, it’s not his fault that no one wants to box him. He has called out all of the top middleweight fighters in the world to fight him, yet none of them accepted his challenge except for Lemieux. The new WBC middleweight champion Canelo Alvarez, who in his last fight defeated Miguel Cotto, has stated that he wanted to fight GGG; but will only do it at a catch weight of 155 pounds (despite winning the belt in the 160 pound weight class, something Golovkin has refused to do) giving Canelo an extremely convenient excuse not to box his mandatory challenger. Alvarez instead will take on former world champion Amir Khan who has never fought above 147 pounds. Billy Joe Saunders who recently defeated Andy Lee for the WBO title, reportedly turned a 3.2 million dollar offer (by far his highest purse of his career) to fight Golovkin. Saunders decided to play it extremely safe in his first defense as he’ll fight Max Bursak who has lost three of his last six bouts. We’ll see if 2016 is the year that the best middleweight fighters in the world fight Golovkin, which if it happens and he prevails, it’ll further strengthen his position as the best pound-for-pound fighter in boxing. Many boxing fans, nevertheless, would argue that the best pound-for-pound fighter in the world should be 28-year-old undefeated world champion Roman Gonzalez (44-0, 38 KOs). He recently scored a ninth-round technical knockout over former world champion Brian Viloria to retain his Ring Magazine and WBC Flyweight titles. He’s a three-division belt holder who has won a world title at the light flyweight and minimum weight divisions. Most pound-for-pound boxing lists such as ESPN and Ring Magazine have the hard punching Gonzalez listed as the best fighter in the world. Unfortunately, he doesn’t get nearly enough media attention that he deserves because he boxes in the lower weight classes. Sergey Kovalev, the WBO, IBF, and WBA belt holder has terrorized the light heavyweight division by knocking out almost everyone. The 2014 Fighter of the Year by Ring Magazine (28-0-1, 25 KOs) has defeated former world champion Jean Pascal twice and Hopkins. One of the fighters in his division that could give him an intriguing bout would be WBC world champion Adonis Stevenson, who has done everything he can not to fight Kovalev. If Kovalev defeats Stevenson and Andre Ward, who he might box later this year, then he’ll improve his position as one of the best fighters in the sport. Undefeated Ward (29-0, 15 KOs) is another worthy candidate to consider as one of the best pound-for-pound fighters in the world. He has defeated excellent opposition over his career that included former world champions, Mikkel Kessler, Arthur Abraham, Carl Froch, Chad Dawson, and world title challengers, Allen Green and Sakio Bika, all with ease. Ward obtained a unanimous decision over previous undefeated Sullivan Barrera last weekend and looked really good in doing so. This was his first bout in the light heavyweight division where he’ll box for the foreseeable future. It was; however, only his fourth fight in the last five years, as he has been plagued by injuries and promotional issues. Hopefully, he and Kovalev can fight one another before the end of the year in what would be an amazing, action-packed bout and give further credence as to who is the best boxer in the world. Next boxing news: Del Valle to meet Crespo April 9! You are here: Home / Boxing News / Who’s the Best Pound-for-Pound Fighter in the World?